In 2009, with General Motors and Chrysler on the brink of financial collapse, the federal government and Ontario's provincial government pumped close to $14 billion into the ailing automakers. Most of it went to GM. Less than 10 years after receiving that financial lifeline, GM announced this past week it was axing close to 3,000 jobs from its operations in Oshawa, Ont. 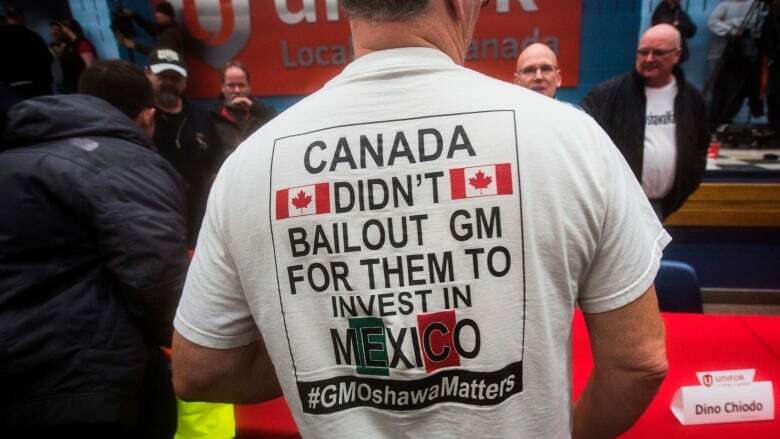 Depending on whom you talk to, the job cuts are a failure of government policy — or GM betraying the province, country and people that kept it afloat in its darkest hour. Wherever they fall on the political spectrum, the assumption is the same: that the responsibility of government is to create lots of new jobs and safeguard the ones people already have. "Governments know that their chances of getting elected are much better when jobs are being created," Kevin Page told The Sunday Edition's host Michael Enright. Page, Canada's first parliamentary budget officer, joined Enright to talk about just how much governments can and should create jobs in the private sector. The GM cuts notwithstanding, Prime Minister Trudeau's government takes credit for Canada's low unemployment rate. President Trump takes credit for the historically low unemployment rate in the U.S. How much credit do they actually deserve? They certainly deserves some credit. In the case of Prime Minister Trudeau, when we go back to 2015 and look at the economy that they inherited, there was no growth in the economy on a year-over-year basis. The unemployment rate was sitting at seven per cent. The amount of jobs that were created over the previous year was a little more than 100,000. Those numbers are dramatically different right now. I think the finance minister and the prime minister can point to some of the investments that they've done for infrastructure, the money that they put into what they call the middle class that's boosted consumption. Behind this, as well, is a global economy that is growing, and it's also boosted Canada and U.S. fortunes. When a government says, for example, in a budget or in an election campaign that they're going to create 200,000 jobs ... how accurate are those projections anyway? Does the government have any real way of knowing? No. I mean, economists would be briefing prime ministers and finance ministers behind the scenes. They'll say, if we get roughly a two per cent growth in the economy, you'll get a couple of hundred thousand jobs. Then below that the government will ask questions like, how much fiscal room do we manoeuvre? How did the idea of job creation by government become a kind of core responsibility? Does it go back to the New Deal in the 30s? It probably goes back at least that far. I think, though, it's definitely evolved over time. Governments know that their chances of getting elected are much better when jobs are being created. Politicians know that's the key number they need to focus in on, in order to improve their chances of getting re-elected. Does the government have any control, any agency over those numbers in terms of job creation? They have agency over where there are opportunities to grow jobs. I think there's opportunities to stabilize employment situations. There's also the agency to be incredibly disruptive and destructive — governments are large. [They're] a pretty big chunk of that the gross domestic product. So they can have a big impact on the overall macroeconomic environment. Also, they invest tens of billions of dollars every year to prop up industries to try to encourage growth. In 2013, the Kathleen Wynne government in Ontario gave Cisco, a company with multi-billion dollar profits, $220 million to hire 1,700 people. That works out to something like $120,000 per job. Saving the 10,000 GM jobs in 2009 ended up costing the federal government something like $250,000 per job. Are we getting our money's worth here? There are times when, like the current federal government, [governments] believe the decisive role for them would be to strengthen the middle class. Governments are saying, if we can strengthen good industrial policy, which would include strong communication systems, strong automobile sectors, a manufacturing base — those are good middle-class jobs. If we invest in that, they believe, it's also very conducive to having a strong middle class. The federal election is less than a year away. What do you expect to see in terms of promises about job creation? Well, it'll be front and centre. I think going forward fiscally, we are running these deficits and the economy is strong. I don't think there's a lot of fiscal room for the governments to make big promises. There are some big ticket items, like pharmacare, on the table that will be discussed. I think it'll be a lot of sprinkling of a lot of small measures, just to try to buy votes across the country. This Q & A has been edited for length and clarity. Click 'listen' above to hear the full interview.